Darrell Madden. Skinhead. His tattooed eyebrows told you so. White supremacist. His Web site was an Aryan nightmare. Murderer. The evidence was irrefutable. How does a person ever forgive someone like Darrell Madden, a beast who infiltrates your family ranks and snuffs out one of your own? He kidnapped, brutalized, tortured and strangled the life out of our cousin Steven Domer with a coat hanger in Oct. 2007 in Oklahoma City. He burned out Steven’s car and left his lifeless body abandoned in a ditch. Forgive?!? I can’t see that happening for me. I cannot see me extending the gift of forgiveness to someone so contemptible. And now, I’m confronted with this pesky forgiveness dilemma every night at rehearsal for the play Dead Man Walking, a University of St Francis production opening March 20. I play the role of the convicted killer’s mother, Lucille Poncelet. Rehearsal has been a nightly process of digging around in the mental vault of human experiences. Like it or not, this excavation always brings personal tragedies into the spotlight. Sister Prejean wrote a book about her experiences helping a death row inmate that became a popular and critically acclaimed film in 1995. Dead Man Walking starred Sean Penn as Matthew Poncelet, the first death row inmate scheduled to die by lethal injection in the state of Louisiana. Susan Sarrandon played Sr. Prejean, the nun who was inexplicably drawn to help this unrepentant criminal. 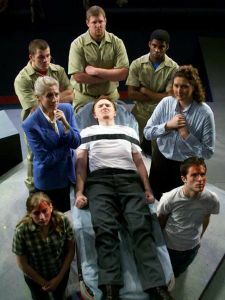 Tim Robbins has written a stage play based on the screenplay about this potent topic and makes the scripts available to only high schools and colleges. While rehearsing Dead Man Walking, I have found that people are very clear about their opinion regarding the death penalty and lethal injection. And opinions about the death penalty and lethal injection can change as people navigate through the myriad circumstance in each of their individual lives. Some may start off against the death penalty, but as Hope Percy’s father says in the play about identifying their daughter — the victim’s uncle, a dentist, was against the death penalty until he had to reach into a bag of lime and fish out Hope’s jaw. After that he was all for it. Or people support the death penalty, until their own son or daughter has to pay the price by being executed for a heinous crime. Then, they are absolutely against it, as they watch their family disintegrate around them, like my character in Dead Man Walking. Although the death penalty was not on the table in our cousin case, the feelings that we carry with us are as intense as any we may have ever felt in our lives. We want justice for our slain cousin. Actors are keen observers of life, knowing that we may need to access those feelings one day. That’s how acting is. You live it, you store it in the vault and then you re-live it on stage, one day. I just didn’t think I would be re-living Steven’s death so soon. And all through the footsteps of Matthew Poncelet, my stage son, my oldest, the convict. Matthew Poncelet in Dead Man Walking is absolutely unrepentant. In his misguided attempt in prison to avoid the needle, he demanded a polygraph test in the Death house, banking on that to prove his innocence, amid the stress of his impending death. In the play, Sister Prejean forces him to confront the part he must actively play in his own redemption. And with redemption comes forgiveness. Because you have been redeemed, so have you been forgiven, as Christ has assured us. Forgiveness. Forgiveness for Darrell Madden, the murderer who descended on our family. I knew I would never be able to forgive him unless he participated in his own redemption. That’s what I told myself a year ago. And then in Oct. 2008, in a courtroom in Oklahoma City, Oklahoma, he decided to own up to his role in Steven Domer’s death. He was actually participating in his own redemption. Just when the family was hunkering down for a trial of denial, he turned the tables on us. Darrell Madden surprised everyone; the judge, the prosecutor, our family and the media by confessing to the murder of Steven Domer. Mort Domer, Steven’s brother refused, to allow Madden to plead guilty until they sat down across the table from each other. Seasoned, jaded, law enforcement officials stood around slack-jawed as Darrell Madden answered all of Mort’s questions about the murder. All of Oklahoma City watched in amazement as these two men talked about the details of Steven Domer’s murder, with the event topping the evening news throughout the region. Madden was going completely over board in participating in his own redemption. I’m not ready to forgive him! One year, a mere 365 days practically from when it happened, and I’m supposed to resolve my feelings and say I forgive you? Not ready. Not ready. Not ready. Through this experience, I have decided that survivors stay angry and vengeful in an attempt to keep their loved one right there with them, part of an emotional energy that keeps their memory alive. Sr. Prejean, played by the lovely Reagan Kreigh, challenges me to work to reconcile my feelings every night at rehearsal. She asks the same question every night that jabs at my heart and makes me swallow hard. A holy place, where I can be embraced and soothed by the healing act of reconciling my feelings and forgiving another flawed human being. A holy, peaceful, beautiful place. I’m afraid I’m not completely there yet and so the journey and the rehearsals continue.